In Luke 6:17-26 Jesus gives us the Beatitudes, teaching us to store up our treasures in Heaven and not on Earth. Younger children won’t understand all the blesseds and woes but they can understand that Jesus taught us the right way to act and interact with others and to store up our treasures in Heaven. Through this lesson they will learn that the BEatittudes teach us to BE kind, humble, loving, and gentle. Target Age Group: This lesson was first written for younger children but could be adapted to any age group in Sunday School. Learning Aim: Jesus teaches us how to behave: be kind, humble, loving, and gentle. Gather the class together and ask the following questions to get the discussion going. Welcome to class! 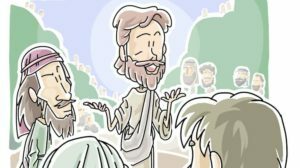 Jesus taught us a lot of things and today we are going to talk about how He told us to behave. Should you be nice or mean? Gentle or rough? Should you put others first? I’m sure that you know that you need to be nice, gentle, loving, and humble. Humble means that you put others first and don’t brag. I’m sure that your moms and dads have taught you these things but did you know that Jesus said we should behave as well? Let’s see what He taught us. You say the Italicized words. Non-italicized words are instructions. Jesus went everywhere, teaching the people and healing the sick. So many people wanted see Jesus and hear His message that it was overwhelming. On this day Jesus taught a special message that we call the Beatitudes. If we follow these beatitudes and do what the Bible says then we will have many rewards in Heaven. Jesus taught that we should be happy even if we were having hard times because our rewards are in Heaven, not on Earth. Jesus also said, ‘But woe to you who are rich, for you have already received your comfort. Woe to you who are well fed now, for you will go hungry. Woe to you who laugh now, for you will mourn and weep. Woe to you when everyone speaks well of you, for that is how their ancestors treated the false prophets. These things that Jesus said are called the Beatitudes. I know that you don’t understand all of these things but here is what I want you to remember: The BEatitudes teach us to BE kind, BE humble, BE loving, and BE gentle. Can you say that with me? Be kind, Be humble, Be loving, and Be gentle. This game is similar to hot potato. Pass a heart (toy or just cut out of paper) around the circle while you say be kind, be humble, be loving, be gentle. If a child has the heart in their hands when you finishing saying the phrase they are out until the next round. Play until you have a winner. Try to get the kids to chant with you. Emphasize that they should be kind to others while they play. When you are finished say Jesus wants us to be kind to others. Even though you all didn’t win you should be kind to each other by saying ‘good job’ or other nice things. Remember that Jesus said that we should store up treasures here, only in Heaven. Say, Jesus wants us to be humble. What does humble mean? It means that we know its ok to serve others and not be number 1 all the time. In the Bible, Jesus showed that He was humble by washing his friend’s feet. We are going to practice being humble by washing each other’s feet! Take off shoes and let them wash each other’s feet with wet wipes. You could also clean the room if you don’t want to mess with taking shoes off. Make sure they don’t use the same we wipe on more than one person’s foot for good hygiene. Use red paper, heart stickers, and crayons to make cards for their parents or friends. While they work talk about practical ways that they can show love to their friends. Say, The Bible teaches that we should be gentle. What do you think of when you hear someone say be gentle? If you have a baby sister or brother then your mom probably tells you to be gentle with them. We should be gentle with everyone. Let’s play a game that will force you to be gentle. You will hold a tissue between your hands, balance feather on the tissue and then do whatever I tell you. Be gentle with your feather! Have each child hold a tissue between their hands and place a feather on their tissue. Tell them to do simple tasks without dropping it such as jump up and down, walk around the room, walk backwards, spin in a circle, etc. (think Simon Says). After the game let the kids keep the feather and practice being gentle with it while they play. Use the activity page to review what they learned today. Close in prayer, asking God to help them be kind, loving, humble, and gentle and to someday learn the true meaning behind the Beatitudes. One concern on the game with the theme of “Be Kind,” eliminating a child who is holding the heart might be a problem. Great insight Connie – Thanks so much for the suggestion! Tony Kummer (Editor) reviewed & updated this page on : February 18, 2019 at 6:42 am. All our content is peer reviewed by our readers, simply leave a comment on any post suggest an update.